In the wild, the vast majority of a wolf's time is spend tracking and hunting prey throughout their territory. They may trail larger prey for days before making their moves, but this is a very important part of the hunt, as they asses the herd, looking for an animal that displays any sign of weakness, to separate and take down. This article is all about that, tracking, trailing and finding the perfect time and place to strike. No one can ever really know how a canine tracks prey long distances, but these will be some of the leading theories and most likely ideas about scent tracking and following animal trails; Both by human hunters, wild life biologists, as well as Search and Rescue workers that train their dogs to track and trail human scents. Some creative liberties have been taken to apply these theories to how your wolf might track down his or her prey; feel free to include (or exclude) as much of this in your writing as you want! 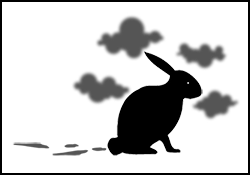 Animals leave scent in the air and in their tracks. Mammals shed thousands of tiny skin rafts per minute, and the larger the prey the more skin rafts they shed in every moment (humans will shed 40,000 per minute!) Some of these skin rafts are heavier and settle right in the tracks of the prey, and others are lights and float through the air, riding on warm and cool air currents. It will come naturally to your wolf—even at a young age – to be able to follow or “track” the heavier skin rafts that a prey animal scatters along the ground as it moves along. Following or “trailing” the skin rafts floating through the air takes a more experienced Hunter, since it requires at least a basic knowledge of the way air behaves in different settings. Wolves will typically use a combination of tracking and trailing, following the scent left on the ground unless the wind brings new information. Experienced Hunters will be able to interpret the wind patterns and alter their course to more quickly find their prey. and the wolf follows the trail in a zig-zag pattern. Skin grafts traveling through the air end up fanning out in a cone shape the farther they travel downwind from the prey. The farther away the prey is, the more diffused and spread-out the scent will be. If your wolf is trailing scent through the air (as opposed to scent on the ground) he or she will take a weaving path through the scent cone on order to zero in on the source of the scent. 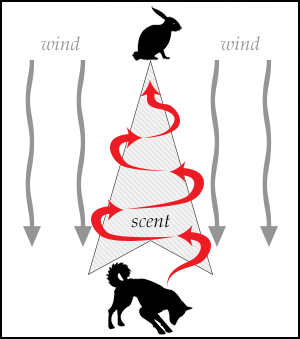 Whenever your wolf comes to the “edge” of the scent cone where she loses the scent, she will turn around and walk back the other direction until she comes to the opposite “edge”. In this way she will slowly weave inward toward the source of the prey, following the shape of the cone. Experienced Hunters will understand the basics of how air moves, and they will be able to apply this knowledge in order to find and keep a scent. The primary rule of airflow is that hot air rises and cool air sinks. So air will have different patterns depending on the time of day, the weather, and the land formation. Normal morning and daytime air is warmed by the sun, and therefore it travels uphill, drawing any scent in the air along with it. Normal evening and nighttime air is cooling, and so it sinks, flowing downhill like water. Early in the day, when air is flowing uphill, scent will pool in areas of high ground. Wolves will not find much scent in valleys, and the pooling scent up on high ground can confuse the novice hunter as it is not obvious where the scent is coming from. It is the opposite at nightfall; cooling air flows down into valleys causing scent to pool in areas of low ground. Wolves will not find much scent up on a ridge, and the pooling scent in the valley can confuse the novice hunter as it is not obvious where the scent is coming from. The experienced hunter knows that the best time for a hunt is in the middle of the day or night, since morning and evening are the peak times for these confusing air currents. The ideal weather condition for a hunt is complete cloud cover; on a sunny day patches of shade and sunlight warm and cool air, creating confusing airflow. Also a slight, steady breeze is helpful since the prey’s scent will produce a scent cone that is intact and easiest for your wolf to follow. Learn more! Thank you “Hound and the Found” (http://www.houndandthefound.wordpress.com) for providing information on scent, tracking, trailing, and air flow patterns.